The latest Glass TV spot unites the bad guys. M. Night Shyamalan's highly anticipated sequel to Unbreakable and Split is only a few months away from hitting theaters, and as the new spot says, "this won't be like a comic book." Shyamalan has been asked for a proper follow up to Unbreakable for years, and he finally unveiled it in the best possible way at the end of 2016's Split, which tied that movie together with the 2000 fan-favorite in a surprising way that brought the director back to the top of his game. 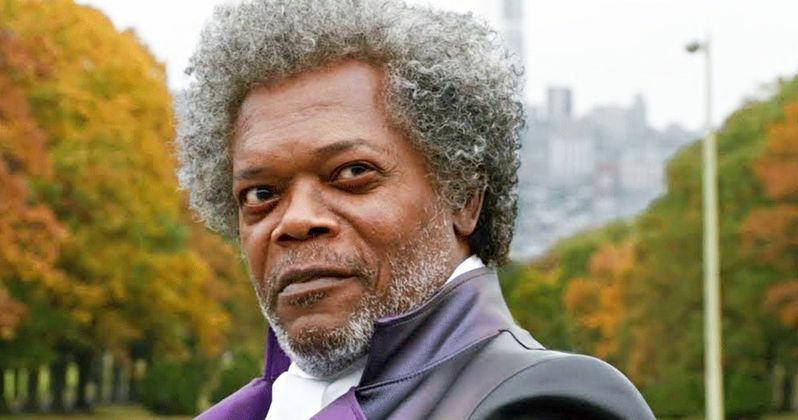 Now, Glass reunites Samuel L. Jackson and Bruce Willis from Unbreakable, while adding James McAvoy and Anya Taylor-Joy from Split. The results look violent and unhinged, with most of the new TV spot putting the focus on the bad guys, Mr. Glass and The Beast. McAvoy looks truly terrifying in the footage, taking his performance from Split and ramping it up quite a bit. Willis' David Dunn is barely shown off in the spot, which leaves one with a dark feeling. Samuel L. Jackson's Elijah, aka Mr. Glass, looks to be pulling the strings here, pitting The Beast up against David Dunn. It is not clear as to how and why Elijah is doing this, but that will be explained when the movie hits theaters early next year. Is he trying to find more superhumans, or just make a point? Knowing M. Night Shyamalan, there will be some twists and turns in the storytelling, which will bridge the worlds of Split and Unbreakable together. While that sounds simple, Shyamalan has a lot of pressure on his shoulders to pull off a movie that fans have been waiting nearly 20 years for. Glass proves that Samuel L. Jackson's Elijah is trying to show Sarah Paulson's Dr. Ellie Staple that superhumans really do exist. He may be in an institution for the criminally insane, but Elijah is up to his old tricks again, and the world is about to see The Beast out in the open, tearing people apart. Elijah goes out of his way to explain the existence of the superhumans, but Dr. Staple isn't entirely convinced just yet. It's going to be very interesting to see how everything unfolds and how M. Night Shyamalan brings these characters back into focus. Glass hits theaters on January 18th, 2019 and the hype is pretty high for the long-awaited sequel. M. Night Shyamalan is keeping most of the story under wraps for obvious reasons, but this isn't going to be a normal superhero movie. It definitely looks more like a thriller than anything else, with some mystery thrown into the mix. James McAvoy's The Beast is much more sinister this time around, which is sure to leave another lasting impression on viewers who were startled by his performance in Split. While we wait for the movie to hit theaters, you can check out the latest TV spot below, thanks to the Universal Pictures YouTube channel.